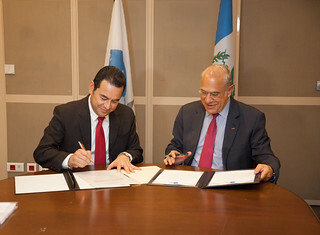 09/06/2017 – The President of the Republic of Guatemala, Jimmy Morales, today deposited Guatemala’s instrument of ratification for the Convention on Mutual Administrative Assistance in Tax Matters ("the Convention") with the OECD’s Secretary-General, Angel Gurría, therewith underlining his country’s strong commitment to greater transparency and international co-operation in tax matters. The Convention is the most powerful instrument for international tax co-operation. It provides for all forms of administrative assistance in tax matters: exchange of information on request, spontaneous exchange, automatic exchange, tax examinations abroad, simultaneous tax examinations and assistance in tax collection. It guarantees extensive safeguards for the protection of taxpayers' rights. The Convention was developed jointly by the OECD and the Council of Europe in 1988 and amended in 2010 to respond to the call by the G20 to align it to the international standard on exchange of information and to open it to all countries, thus ensuring that developing countries could benefit from the new more transparent environment. Today, with 111 participating jurisdictions, it is the world's leading instrument for boosting transparency and combating offshore tax evasion and avoidance. The Convention's also serves as the premier instrument for implementing the new Standard for Automatic Exchange of Financial Account Information in Tax Matters developed by the OECD and G20 countries. It can also be used to swiftly implement the transparency measures of the OECD/G20 Base Erosion and Profit Shifting (BEPS) Project such as the automatic exchange of Country-by-Country reports under Action 13 as well as the sharing of rulings under Action 5 of the BEPS Project. The Convention will enter into force for Guatemala on 1 October 2017. President of Guatemala, Jimmy Morales, deposits Guatemala's instrument of ratification of the multilateral Convention on Mutual Administrative Assistance in Tax Matters. Bercy, Paris, France.